If you ask any racing fan, they will tell you if you haven’t been to Warrnambool’s May carnival then you aren’t a true racing person. Warrnambool is famous for the 3 day carnival in May that mixes flat and jumps racing in a carnival like no other in Australia. But as I found out last week, its not just the carnival that makes this large coastal town famous. Like all coastal towns, Warrnambool is a destination for families wanting to get away from Melbourne. A 3 hour drive from the city and you feel a world away from the hustle and bustle. The first thing you notice is how welcoming and friendly the locals are even after 3 weeks of Christmas and school holiday crowds. The second thing is the summer climate, easily 5 or 6 degrees cooler with beautiful ocean breezes cooling down the hot sun, a stark contrast to those freezing cold winter days during the carnival. Lady Bay is synonymous with horse training by Warrnambool locals. And it’s been going on for years, long before the media shone a spotlight on it. So at the crack of dawn on Thursday morning, I dragged the Mrs and two girls out of bed at 6am to see it for myself. Darren Weir’s Warrnambool team are amazing. Maddie Raymond, Tyson Kermond and Nick Gottleowski were all on hand to make my family and I welcome from the time we arrived. Never mind managing the 50 horses coming off floats and in for a swim, doing their morning exercise and then washed down out of buckets and back on the float again. The Weir hospitality is extended no matter what facility you are at, whether it be Ballarat, Trevenson Park or Warrnambool, and whether Darren is around or not. We were guided to the cafe for the early morning coffee, told when our horses were going to arrive, even the best vantage point for the perfect photo. And luckily the water was warm enough to venture in and follow the horses around. I had wondered whether non-racing people would think I was mad for getting up at the crack of dawn to watch the horses train. But when we arrived at Lady Bay, it was apparent that even the non-racing tourists were mesmerised by what was going on. Families stopped and watched, children wanted to get involved with a pat and a photo to capture the moment. And all that attention must have seemed strange to the Weir team just systematically working through their morning tasks. “You know if your horse is at Warrnambool it must go alright” says Nick and Maddie. “They get treated better than you and I do that’s for sure” says Nick. There is something about watching these majestic animals take to the water so naturally. The Bool has such a calm aura you can’t help but relax. It’s a mixture of the cool sea breeze, the gently lapping water and the laid back lifestyle that you immediately slip into when you arrive. No one is in a hurry and the horses are clearly the priority as they take centre stage every morning on the beach from 6am to 8.30am. The morning was wrapped up when all four RTD horses, Krone, Anjana, Oberland and English Gambler, were worked. The family and I went off for breakfast, and the horses returned to the Warrnambool stables, housed at the famous track that has been racing for over 100 years. While the family had a well-earned afternoon nap, I pushed on to the Warrnambool racecourse to run my eye over our horses afternoon exercise. Driving around the racecourse and viewing all of the different tracks where the Grand Nationals and the Brierly Steeples are held, along with the time-honoured Warrnambool Cup. The Warrnambool Racecourse has a special feel about it that is normally reserved for the big city tracks like Flemington and Royal Randwick. 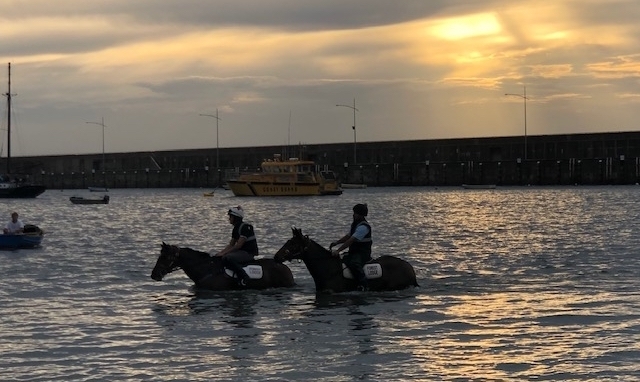 Work starts again around 2pm for the Warrnambool team, and every horse has a swim at the racecourse pool. Once they complete either one or two laps, they again get an afternoon hose down and then have a leisurely walk on the walkers for around 30 minutes. I was again surprised by the calmness of the horses and the staff going about their business. It was only then I realised that I had not seen one horse act out, play up, buck, kick or resist what was being asked of them. I had been around the horses all day, and every horse seemed to be relaxed, in a peaceful and tranquil state, like nothing could perturb them. I had my two girls, aged 4 and 5 yrs, patting the horses, running around, yelling and screaming on the beach, and not one horse turned a hair. The horses thrive in this environment. It’s no wonder Weiry brings all his best horses here. The Bool is horse heaven.